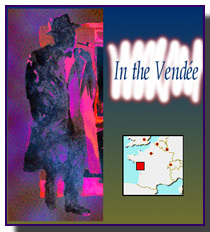 In disgrace with his superiors, Maigret was appointed as a police chief in the small town of Luçon, where he has been bored for three months, when a remarkable case requires his attention in the nearby village of L'Aiguillon. One morning the retired judge Forlacroix finds the dead body of an unknown man with a battered skull. The judge lives with his daughter Lise, who is very beautiful, but simple minded. She shares her bed willingly with the young men of the village. The most assiduous of these young man is Marcel Airaud, who escapes straight away at the beginning of the investigation. The judge, Forlacroix has another child, his son Albert, but the two men don't like each other. They are both convinced that Albert is not Forlacroix' natural child. Albert remained in the small village only to be close to his sister and take care of her. Feeling suspected, the judge confesses to Maigret a murder of fifteen year ago. While he exerted its functions in Versailles, he killed his wife' lover before leaving her. He also discloses to the police chief that he suggested to Marcel Airaud that he would marry his daughter. Forlacroix is then put in prison for the old murder and Maigret takes care of Lise by placing her in a special institution. The victim is identified. It is Emile Janin a psychiatrist from Nantes whom Marcel Airaud knew at one time. Maigret understands that Airaud, before deciding to marry Lise, asked the doctor to examine her, without the knowledge of the judge, in order to know if she was insane. Therefore it is unlikely that Airaud is the murderer. What is the escape a cover-up for then? Airaud is found with Albert. Questioned, the two young people keep silent. In their presence, Maigret, helped by the observations of a gossip of the village, Adine Hulot, will try to reconstitute the case. He has just discovered an element that the judge had hidden from him: Lise is pregnant. Airaud was unaware of this fact, but Albert was well-informed and wished, out of pride, that Airaud would marry his sister to put an end to an irregular situation. The night of the murder, Albert introduced his sister to the psychiatrist Janin. The doctor declared that the girl was incurably ill and that it was his duty to inform Airaud of this fact. Understanding that Airaud would now refuse the marriage, Albert assassinated the doctor. 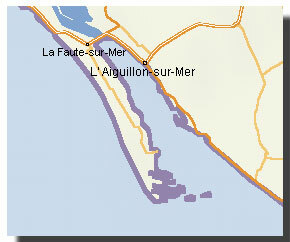 This story is situated in L'Aiguillon-sur-Mer, a village (2.200 inh.) 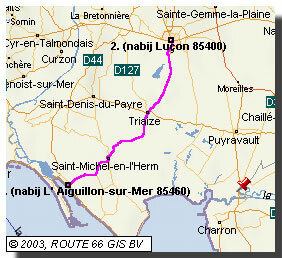 in the South of the Vendée Department. 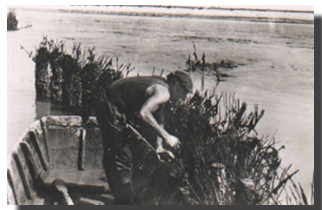 In L'Aiguillon the main occupation is mussel fishing. It still is. 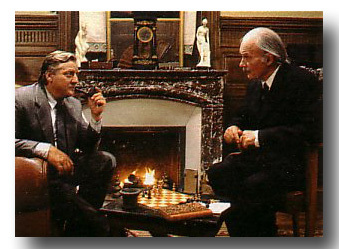 - Photo from: Maigret et la maison du juge (La maison du juge). France 2/Dune/ Filmes Do Tejo/RTBF/Télévision Suisse Romande/ Ceska TV (French). 1992. Réalisation : Bertrand Van Effentere, Scénario : Santiago Amigorena, Bertrand Van Effentere, D'après le roman de Georges Simenon, Images : Dominique Bouilleret, Maigret: Bruno Cremer, Juge: Michel Bouquet. (1) Translation and compilation from: Maurice Piron, L'Univers de Simenon, Presses de la Cité, Paris, 1983, p.296. Translation of excerpt: G. de Croock. (2) This conflict concerns the merger of the "Brigade spéciale" (Maigret's Homicide squad) and the "Sûreté" (intelligence service). (3) Mussels are not really "fished". On the coast of the French Vendée they are cultivated on wooden poles connected with branches. 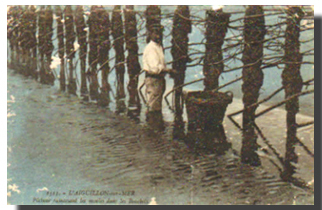 At low tide the poles rise above see level so that the "boucholeurs" in flatboats or in their waist high gumboots can pick the full grown mussels - see images.